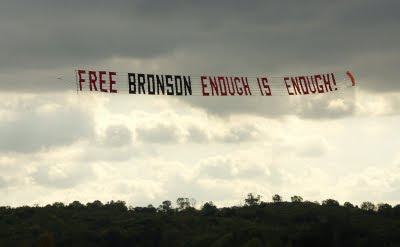 An unusual mission for Airads today, over Long Lartin prison in Worcestershire and organised by the supporters of Charles Bronson, with the message: “FREE BRONSON- ENOUGH IS ENOUGH”. “Charles Bronson has been imprisoned now for 35 years 30 of which have been in solitary confinement and despite 10 years good behaviour he has still not been released or de-categorized. Charlie's human rights have been constantly breached throughout the years and his next parole hearing is not until 2011 even though he is 8 years over his tariff. Charles Bronson continues to support and donate to charities mainly to under privileged children and is a dear friend to all his supporters as such we hold protests regularly to gather signatures for his petition. Charlie has no voice but we do! 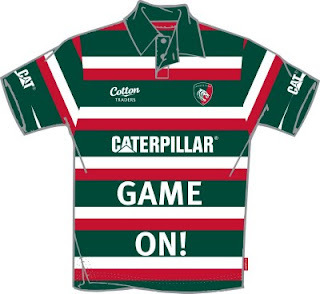 Paedophiles and rapists are released back into the public regularly. A woman who kills her 2 teenage daughters gets 33 years imprisonment, Charlie is still in solitary confinement after 35 years and has never killed anybody. " 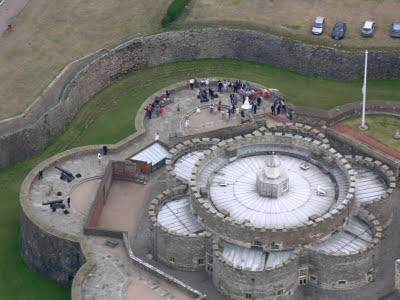 A nice wedding happening at Deal castle this afternoon. 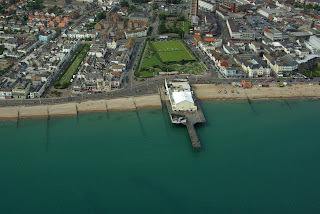 I was temporarily confused through not knowing that Deal Castle and Walmer Castle are very close and look almost identical from the air. After several minutes circling the latter, where nothing obvious was happening, I finally arrived at the former, where the reception had just started. We were lucky with the weather too. So that's Leeds Castle last Friday and Deal Castle today. Seem to be making a habit of fortifications! Congratulations to Dhiren and Hema who had a very special afternoon at Leeds Castle in Kent yesterday. 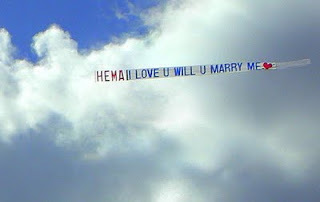 Dhiren, proposed to Hema, who said "Yes", maintaining our unbroken record of marriage proposals! After a week of very "iffy" weather, they chose the perfect day for their very special walk in the country. 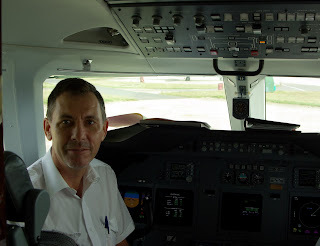 Pulling the stops out, I can do it but as I'm due elsewhere at the same time, I have had to pull in another pilot to take my place. 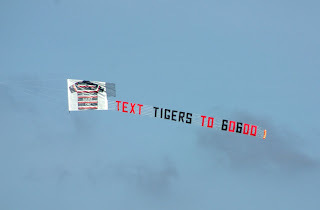 He's making up the banner now while I type this entry. 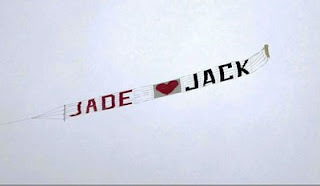 Once the banner's finished and he's en-route, I have to call Bob Crow with an ETA and so as long as the strengthening wind speeds don't get in the way, I might catch the result on the late evening news. Vestas sit-in: Plane With Banner Flies Over Vestas from Ventnor Blog on Vimeo. Today is the date of the annual Tolpuddle Martyrs rally in Dorset but the howling gale outside put an end to any idea of flying two of the trades union banners over march in the tiny village. For the last three years, Tolpuddle has been "iffy" from a weather perspective but having taken two aircraft down there this morning; landing at the top of the large hill which is Compton Abbas, it became quickly clear that we weren't going to have a miracle pause in the windspeeds. 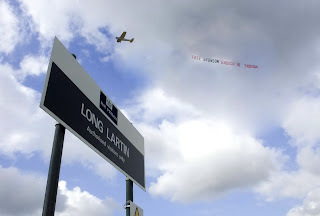 Airads was flying a 'Jury Team' election banner all the way along the M25 from Rochester to Reading yesterday. In the air, I could hear the rescue services looking for the reportedly missing light aircraft from Cambridge to Lydd; a helicopter and the Coastguard Cessna from Manston (pictured). 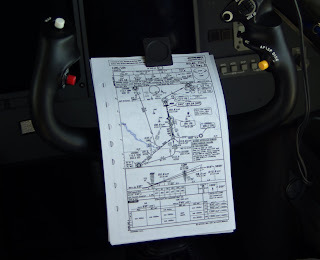 I rather think that the pilot, a Swiss, I hear, may simply have gone somewhere else and forgotten the strict rules governing letting ATC know of a change of destination. I hope so anyway. An entertaining afternoon for Airads this Bank Holiday Monday, flying a banner for the Driftwood Beach Bar at Sandown on the Isle of Wight. Having finished the flight we dropped in for lunch and without a doubt it's a delightful spot with excellent food. 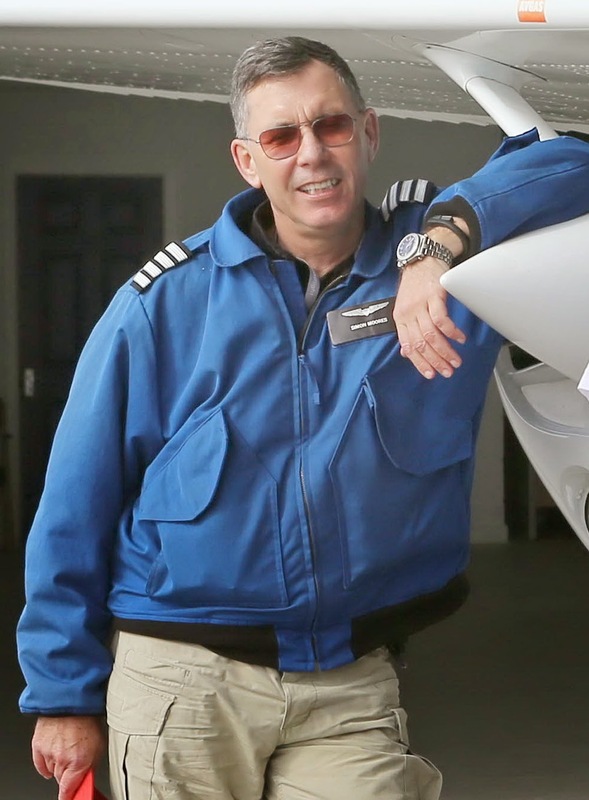 Highly recommended for both visiting pilots and tourists alike! This coming week we have a major exercise for the Taxpayers Alliance, flying banners protesting the EU tax burden over London, Manchester, Birmingham and Leeds/Bradford with four aircraft involved. Given the state of our national economy, I suspect a great many people will be sympathetic! Airads will be flying a giant sheet St George's Day flag over Bradford today as part of the city council's parade and celebrations to mark the event. Over 1,000 square feet in size it should be vsible from a long way with excellent weather expected along the route of the parade. 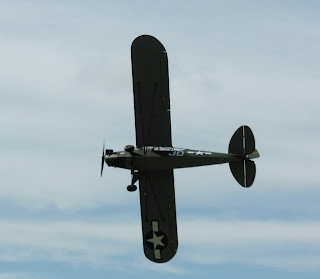 Next week, Havering Coucil in Essex, have asked Airads to fly a banner (pictured) promoting their "Night Life Awards" and from the look of it, it should get the message across! I'm just back from taking photos of 'Operation Stack' and the blockade of Calais harbour. I do feel very sorry for al those caught up in the chaos this is causing, with goods vehicles queuing for miles on the M20 from about the area of Leeds castle and P&O ferries sitting in Dover, going nowhere. On the French side, to be honest, there is very little to see, other than a scruffy collection of French fishing boats strung out a mile or so from the entrance to the harbour, with a Coastguard vessel in attendance. Not really a blockade as I would have imagined it, more of a loose picket. I very much doubt that the fictional Captain Hornblower, Nelson or even Drake would have given them much thought in the past So the blockade will stand and Dover and the M20 are at a standstill with businesses and families marooned on either side of the channel, I'm sorry 'La Manche', unless they have a Channel Tunnel fare. Visibility was pretty dire for most of the day but better on the French side by lunchtime with a strong wind blowing. I suspect I set a new personal best with Calais to Dover in 18 minutes with the wind behind. 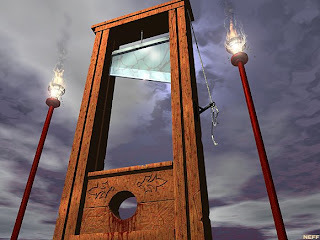 Alright for some I know and perhaps I should be ferrying luckless families back to Dover by air in the style of the Scarlet Pimpernel? 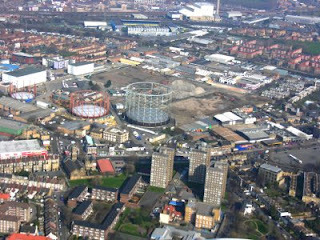 Captain Snap was busy over London's Old Kent Road this afternoon taking photographs for construction giant Volker Fitzpatrick. Very hazy conditions made the exercise a bit of a challenge and of course, because this is inner London, we had to borrow a Seneca twin-engine aircraft from Stapleford. 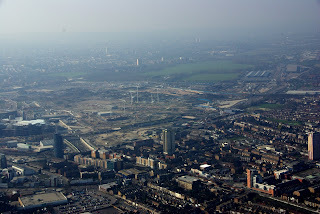 On the way back, the pace of development at the 20012 London Olympics site at Stratford was also noticeable. The return to what has become a regular fixture, this weekend, the annual 'FastFit Station Tyre Sale' at Milton Keynes. 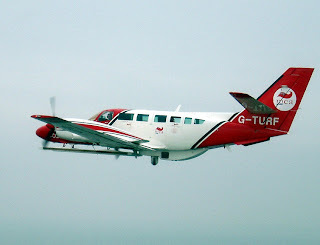 In fact, we were very lucky to get the flights in on Saturday as the weather on the days either side was simply dreadful. 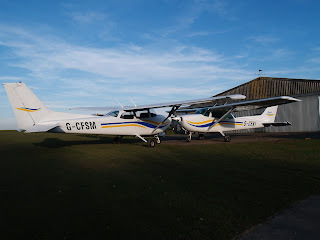 We had been booked for two days but had to double up on the one as both our operating base airfields were badly flooded at Rochester and Maypole. It took two attempts on a semi-frozen grass surface to get airborne from the latter, off pass North London towards Turweston, where we flew the Milton Keynes banner from, on what became a glorious winter's day, in the short interval between two extreme Atlantic weather fronts. The aircraft is presently back at Manston in Kent with its hard runway surface and tied-down against today's gales. If I had attempted to land at Maypole I suspect I might still be stuck in a vey large puddle on the runway. One Photo of the wood washed ashore at Ramsgate for the papers this afternoon. 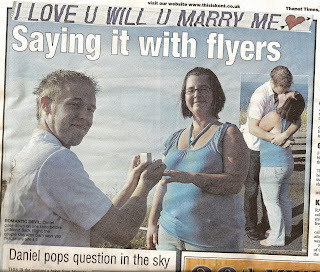 (photo is copyright) but I thought readers might like to see the results. The weather broke sufficiently for a flight just before sunset and so the image clarity isn't as good as I would like. 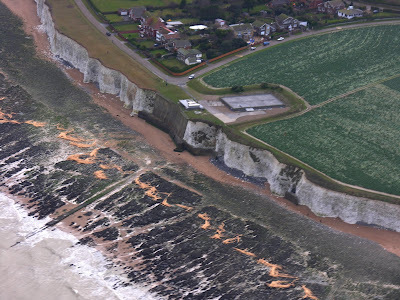 The timber, which came from the cargo ship Sinegorsk in the English Channel, began washing ashore on beaches around Ramsgate and Broadstairs following the strong southerly winds overnight.